Holistic Kidney does not advocate discontinuing all treatment with mainstream doctors. Dr. Henderson does advocate patient education and making informed choices about all options available. 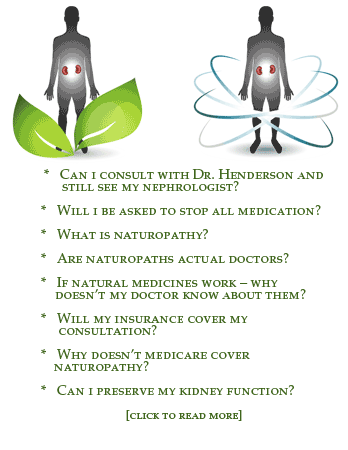 Treatment with Dr. Henderson usually involves taking natural substances as an adjunct to what the patient’s nephrologist recommends. Dr. Henderson: Mercedes, your book is a real inspiration. Few people would be functioning without dialysis after having had very low kidney function. What made you think you could change your situation with an alternative approach? Mercedes Hawkins: Thank you. I am glad to be an inspiration. I felt my situation could be changed with alternative health because animals are never attached to machines. They eat something green whenever they get sick. It just seemed unnatural to be dependent on a machine. I asked myself what did our ancestors do to heal themselves. And the answer is always herbs, roots, plants, stones and other natural products that grow directly from Earth. This was easy for someone who grew up semi-exposed to it being from the Caribbean and all. Dr. Henderson: For many people kidney disease is a wake up call that they are living a life that is unhealthy and disconnected. Do you feel looking back that this was an opportunity to live in a more genuine, healthy way? Mercedes Hawkins: Yes. Absolutely. I look at how far I strayed from the lifestyle of my Caribbean people. This includes eating organically and getting lots of sunshine, fresh air and good laughs. Rarely do they eat canned goods or fast food. Governments give people two hour lunches so they can eat at home. But in industrialized nations it is very fast paced. So we are stressed, eating on the run in an effort to pay for resources that were once free. We no longer walk barefoot in touch with nature and nutritious soil. We walk with shoes on concrete and interact with machines such as cell phones, television and computers. In times past and in third world countries, people rely on clairvoyance – their mind becomes the phone. They use their mind to tap into the akhashic records rather than rely on a computer to get information. And television tells us lies about vision whereas our people saw visions of the future, past and present without a gadget thank you. So now we pay, we expose ourselves to radiation and dangerous waves. Don’t forget the microwave and how it kills nutrients. I was eating less fruits and veggies and drinking less water. Good food is harder to find– you can’t just pick it off a tree. And tap water tastes nasty. I know it’s the chemicals that I was tasting. I realized this after I did the research. The natural sweetness in nature was replaced by white sugar and so on. So yes, this for me was an opportunity to get back to nature because the idea is to get out alive. That is why our appendages should never be sliced. It is more difficult to elevate without them. Dr. Henderson: How did you first know that you had kidney trouble and did you try mainstream medicine first? Did they give the process in your body a name? Did you feel pressure to have biopsies? Mercedes Hawkins: I first learned I had a bad kidney in 2005 during a visit for a pain in the stomach area. I had irritable bowel syndrome. The health officials said there was no relationship between irritable bowel syndrome and kidney problems. They named it kidney problems at first. After multiple procedures they called it kidney failure but in between I had cooperated with the treatments. There were voiding cystograms and too many procedures to name. Yes I did have a biopsy but I was put to sleep. At that time they told me I wouldn’t live that year (2005). I was also warned several times to write a will. A firm voice told me to bring myself to the hospital for a transplant. Dr. Henderson: Were your family and friends supportive of your choices? Mercedes Hawkins: No. I had to feed myself during the mini-stroke, which wasn’t so mini. I couldn’t move my hands! My other half was very uncooperative. He wouldn’t feed me and showed resentment that I wasn’t working. He even made me drive in that painful condition. Some were acting selfish that they lost their cook. It was all a very dysfunctional family full of abuse. My son encouraged me to sell the book once I wrote it. Friends and co-workers bought the book so I guess it depends on who you speak to. My sister said it is too serious a condition to play with. But I feel that had I listened I would be on a transplant waiting list or I would have one less kidney. I was determined to believe that it was reversible, after all cancer is reversible so why not a kidney? Isn’t cancer supposed to be the worst disease? I didn’t want to claim it although it was very real. And sure enough my research shows that it is reversible. Dr. Henderson: Many patients invest a lot in their doctor/patient relationship and find it difficult to go outside the relationship for help. Did you tell your nephrologists about your healthcare decisions and did you maintain a relationship with your doctor even after you chose to not go the way of prescription drugs and dialysis? Mercedes Hawkins: I told the doctors about my choices. Some fussed with me and scolded me. The other two had grim looks on their faces. I had a good primary doctor who was willing to try some of my herbal recommendations for herself. When it would work she would come back smiling and tell me so. Even with that she felt this was too serious of a case. I kept a distance from the nephrologists and just stopped going. The urologist spoke very firmly about following standard procedures and protocol. I had to use charm to talk him into seeing it my way. Eventually, he said yes you can live with just one kidney. I did not want to come back to them because they kept pushing conventional medicine. One doctor even admitted that a medicine I was taking causes strokes and named all the side effects I was having as possible causes for the extra symptoms. So in a way I was lucky that those two doctors were open to some of my ideas although they never officially condoned them. Dr. Henderson: It sounds like you made bold choices, eliminating not just toxic substances but toxic relationships and situations in your life. What were the hardest patterns in your life to change? Mercedes Hawkins: Bold choices indeed. All toxins had to go! Including toxic people. A friend once told me your spouse can literally make you sick and suggested I probably had kidney problems from putting up with his stunts. The hardest choice was leaving him because I was out to prove that someone in my family could live happily together without divorce. I was addicted to him, but enough is enough. All the choices were hard because we become complacent with patterns, whether it’s sugar, coffee, meat and so on because we see everyone else doing it. So we feel we are the oddball…that something is wrong with us, instead of realizing that there is something wrong with the world. Dr. Henderson: Many people feel trapped in a job they dislike for financial reasons and believe that organic foods and alternative medicine is expensive. What can people with kidney issues do to empower themselves and have a lifestyle that is in their reach? Mercedes Hawkins: Although some organic foods are more expensive, this isn’t always the case. It is a matter of what is on demand at the time and how many crops your local farmer puts out. You must do comparison shopping and you would be surprised; this applies whether you are at a health food store or at your local grocer. More grocers than ever have organic sections because people are demanding it. Now even Walmart is boasting about “organic” sections in the store. Everyone wants to jump on the bandwagon. Just know it is there. Kidney patients need to join coops because the annual fee pays for itself due to the discounts. International stores carry organic foods as well. Dr. Henderson: Did you have any teachers/mentors that were helpful in your learning process? Mercedes Hawkins: Queen Afua was an inspiration since she healed herself from asthma. But at the time I wrote the book these people were in other cities. I did admire Dr Llaila Afrika because he always spoke of the Afrikan model of healing. Too bad I never met him. His book was inspiring though. Dr. York always taught everyone to “do your own research” and that lesson came in very handy. Neetta Black suggested that overeating can cause bodily dysfunction and encouraged me to write the book pertaining to my fight with chronic kidney disease. Dr. Henderson: When the doctor told you dialysis is imminent, what were the immediate steps you took to regain your health? Mercedes Hawkins: The immediate step was a colonic. That was drastic for me. I knew the toxins had to go and soon. The natural antibiotics were obtained from another soil (not American) because the American soil is depleted of minerals. This applies to all the herbs really. I did not concern myself with taste when it got that serious. I had to swallow the bitter pill literally. I worked from the inside out, touching every organ that interacted with the kidneys. I did a heavy metal detox. For people who cannot afford certain natural doctors or procedures there is always a way to do it yourself el cheapo. Dr. Henderson: Many people experience elevated potassium when the kidney function is very low, which is dangerous for the heart. Since many fruits and vegetables are high in potassium, was this ever an issue for you? Mercedes Hawkins: Indeed. I had to give up one of my top two favorite fruits, the banana, since it is so high in potassium. But it beats the potassium that we get from canned foods any day. One thing I must say about canned foods. They are very high in potassium! Potassium in canned goods comes disguised as preservatives. And read the label on the prepared foods too. Same rule applies. Elevated levels of potassium are found to be dangerous to the kidneys, according to some recent studies. Dr. Henderson: Is your health routine different now that you are maintaining your health compared to when you were facing the threat of dialysis? Mercedes Hawkins: My health routine involves more walking but never to the point of exhaustion. It involves meditating to relax my mind since stress triggers disease. Water drinking is crucial, but now I know to drink neither too little nor too much. I don’t depend on the microwave as before. In fact, I sold it. But family members started complaining so I bought another one for them. Dr. Henderson: In your book, How I Avoided Dialysis And You Can Too!, you link the explosion of diabetes, hypertension and kidney disease to larger problems in society. What shifts in our collective consciousness do you think will put us on a more healthy path? Mercedes Hawkins: The realization that we are in this together. And if we pollute the living reef we hurt ourselves because much medicine comes from under the sea– medicine that is very important to kidney sufferers. Everyone needs to watch the documentaries that speak on this topic. People need to realize that false salt, false sugar and false flour have zero nutritional values and are literally poison! Throw it out. Plants have sugars, the sea has salt. What are we waiting for? Nature provides everything. Dr. Henderson: You seem to be in a very happy, empowered place in your life—where many people with kidney trouble would like to be. As it is often the day-to-day stresses that are most taxing, could you describe a typical day in your life and how your stay on track? Mercedes Hawkins: I wake up and thank Source for waking me up to see another day. I do not get up until I smile and thank my ancestors one by one for helping me and directing me. I notice that when I pray to them to keep me from getting traffic tickets it works. They intervene for me during court cases when I ask, even when I should lose. I learned this from a friend, Teya. I put on a smile early on and eventually my brain thinks I’m happy so it acts happy throughout the day and I find everything funny. The brain doesn’t know any better so it reacts to how it is fed. I find I have better interactions with my boss when I fool it into thinking it is happy. And next thing you know I have a wonderful day. I talk to my co-workers often about healthy alternatives. It keeps me focus to hear myself repeat this and they love it. When I bathe in the morning I wear natural deodorant, powdered cinnamon. It is natural so how can it hurt me? The skin is an organ so if you put commercial deodorant the heavy metal aluminum gets into your system. At night when I bathe I use clay under my arms. This not only keeps odors away when we sweat at night but it keeps tumors at bay. Those of us who have flappy arms watch out it can turn cancerous. Too much fat. Bras contribute to breast cancer, but also commercial toiletries because the skin is not breathing. When you love yourself like this your body will love you back. I alternate and use amber resin as perfume. You would be surprised at the level of toxins we use besides foods. I eat oatmeal or do a hashbrown without potatoes using yucca which is healthier. Or I may eat fruit based on the fruits that heal the kidneys. Instead of chips I used pure natural salt, which has a curative aspect to it. I drink water throughout the day. The brain sits on water! Try depriving your brain, or drinking sodas and see what happens. Save yourself a stroke. I do not use commercial teas. I use the powders, barks, herbs and I don’t necessarily strain it. It is healthier that way. Nothing goes to waste. I am saving money by bringing my lunch and it is healthier too. Dr. Henderson: Any other thoughts you’d like to share with readers? Dr. Henderson: Mercedes, thank you so much for talking to us. How I Avoided Dialysis And You Can Too! is available at lulu.com.